Part number FK26 / #2767. 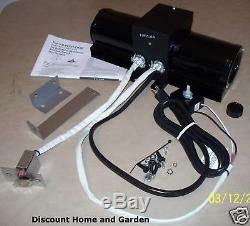 This optional variable speed blower can be mounted on stoves to improve heat circulation. 110V to 115V with 7.5' cord. Includes thermo snap disc switch so the fan will only run when the stove is hot. Includes mounting brackets, hardware, and installation instructions. Overall Blower Length 13.25 in. Fits Vermont Castings Radiance direct vent, natural vent, vent free stoves. Fits Stardance direct vent and natural vent stoves. Fits Dutchwest direct vent and natural vent stoves. Fits the Encore and Defiant wood stoves. Discount Home and Garden Products accepts payments via Pay Pal. We accept credit cards processed through Pay Pal. Feedback Policy Your satisfaction is important to us. These charges are the buyers responsibility. The item "Vermont Castings Dutchwest Blower Fan for Gas Stove FK26 2767 Factory Original" is in sale since Wednesday, November 01, 2017. This item is in the category "Home & Garden\Home Improvement\Heating, Cooling & Air\Fireplaces & Stoves\Replacement Parts". The seller is "warmerplace" and is located in Saint Clair Shores, Michigan. This item can be shipped worldwide.